This model is very rare and not so well documented and was discussed some years ago on the forums of the temple of Wat Kositaram, where the many Looksit (devotees) of Luang Por Guay joined together to investigate, research and authenticated it as being not only blessed, but also made by Luang Por Guay, due to the presence of his inimitable Muan Sarn Sacred Powders and Sabu Luead particles found in this amulet. Since the devotees of the temple confirmed this model, it has become increasingly popular with devotees, and is now very rare to find in any circumstance. This model is in pristine condition and has been preserved in its original state, with extremely clear details. the Muan Sarn Sacred Powders are extremely rich in Puttakun Powders, and have a high concentration of Wan Sabu Luead permeating the substance, visible as small wine red particles within the coarse grainy Muan Sarn. The front face of the amulet has a gracefully styled image of the Buddha, with one hand placed palm upwards on the lap, and the right hand of the Buddha is raised over the chest in beckoning gesture (Kwak). This of course, for Thai Buddhists, invokes Metta Mahaniyom Mercy Charm and Maha Sanaeh Seductive Attraction, as well as Kaa Khaay Business Attraction, to Beckon Customers. 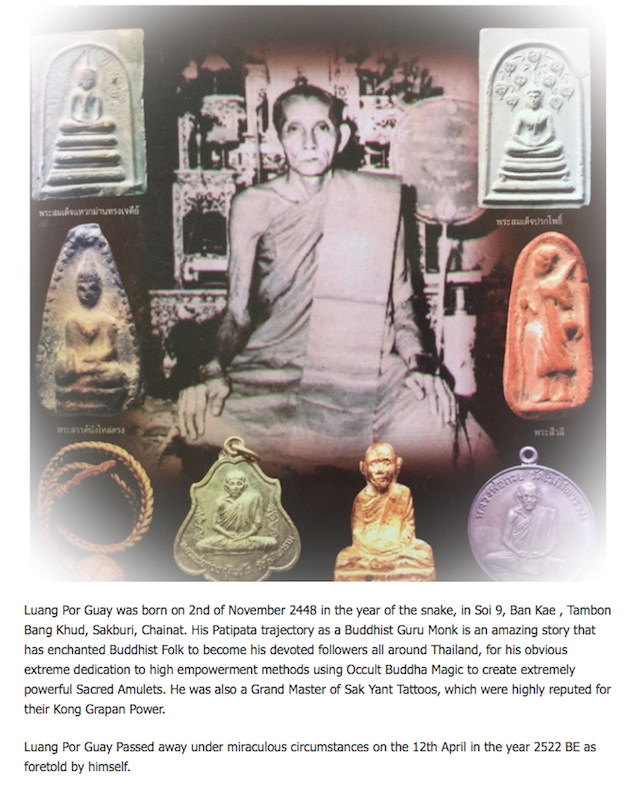 Luang Por Guay was a powerful Sorceror Monk and Sak Yant Master with infamous powers of Kong Grapan Chadtri and Klaew Klaad Magic, whose large pantheon of Buddhist Votive Tablets and Krueang Rang Talismanic Occult Charms are amongst the fastest disappearing amulets of the Present Era, since a massive increase in faithful devotees in recent years, have begun to deplete the amulets from public circulation. 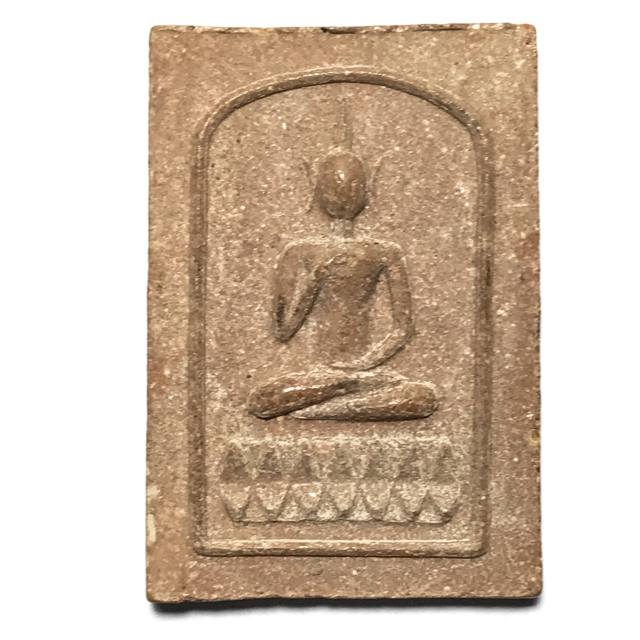 Extremely rare and highly favoured by the Devotees of Luang Por Guay, the Pra Somdej amulets of Luang Por Guay had different versions, because mostly, Luang Por Guay would press this model from various Pra Somdej models which he would take to create new block presses, as he visited different temples to attend empowerment ceremonies and chant the Buddha Abhiseka. But this model is a very rare model which was only confirmed as Luang Por Guay by the temple only just a few years ago. Even an expert and avid collector, could not expect to see more than ten of these particular amulet in a lifetime of amulet collection. The amulet is for Mercy Charm, Good Business, Prosperity, Auspicious Karma, Protection, and to Deal with all Obstacles and Inauspicious Karmic Effects. Below; Pieces of Wan Sabu Luead from the repository of Luang Por Guay, one of the magical Muan Sarn Components used in the sacred Powders of this amulet, highly valued for its multiple magical properties.